Ok, so your organization has invested in a recycling program, congratulations! But having an effective recycling program means a lot more than just adding some new blue bins to separate your paper and cans. Your organization may be missing the boat and not picking the low hanging fruit when it comes to increasing the recycling program and employee participation. Here are just 6 simple things your recycling program may be missing to get the most bang for your buck, increase your waste diversion, and set off to become a recycling superstar! Effective waste diversion is a result of the people working to drive the recycling program. 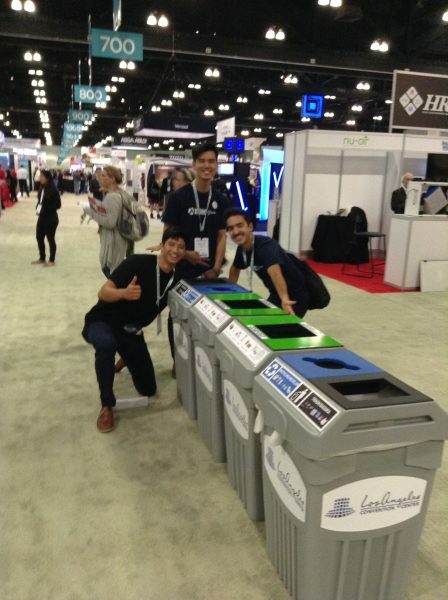 Setting up an internal “green team” or a “Sustainability Committee” is always one of our first recommendations when it comes to increasing your waste diversion. Start with 4-7 employees from across your organization who will oversee launching and monitoring the recycling program. This team should be responsible for conducting regular waste audits, setting goals, and brainstorming new initiatives and communication campaigns to promote the program. It’s important to include key stakeholders such as upper management and custodial staff to be inclusive and build ownership for the program and shared responsibility. Upcycle Station at National Geographic. Setting up an “upcycle” station in addition to your recycling program is a great way to be proactive and to recycle and reuse old office supplies and equipment before they end up in landfill. 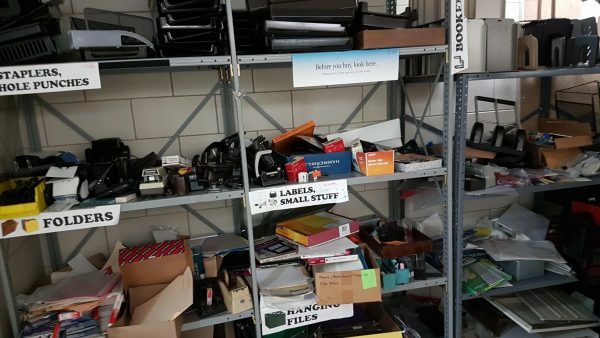 Set a designated area or shelving unit aside in your facility to collect and store all old office supplies. Whenever employees have old office furniture, phones, computers, staplers, file folders, etc they can be organized and placed in the “Upcycle Station”. When an employee is in need of a “new” office supply, make it protocol to check the Upcycle Station before re-ordering any new items. If you’re recycling program is off to a great start and you have been successfully separating paper, plastics, and cardboard, then adding an organics stream is the next natural step to drastically increase your waste diversion. Compost is a valuable resource and the collection of organic waste can considerably increase your organization’s diversion rate and even help you reach zero waste. 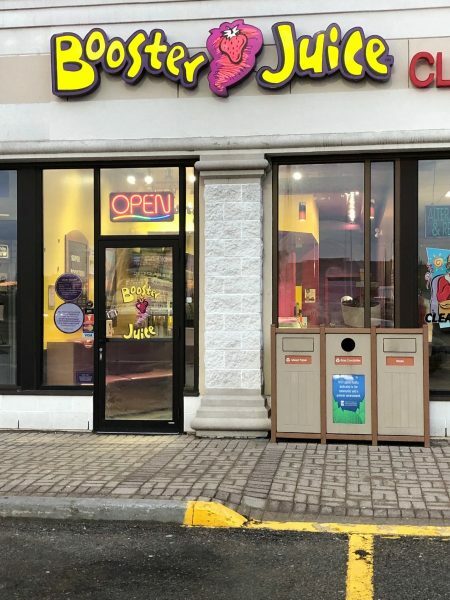 For example, collecting paper towels in your washroom can dramatically increase the amount of garbage you divert from landfill. For everything you need to know to start a compost program check out: Organics Collection – How Saving the Planet Can Save You Money. 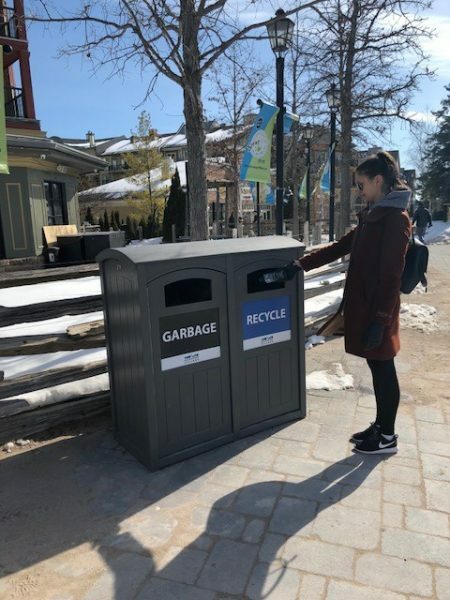 Sure, you may have a recycling program, but if your staff and visitors are not aware or know how to properly participate then your program won’t be effective. At CleanRiver, we strongly believe that communication is one of the most important aspects of an effective recycling program and a vital component to the CleanRiver 3C process. Create excitement about your new recycling program, or revitalize your current program, by telling everyone about it! Promote the program using wall posters, table toppers, ceiling hangers, and announcements during company meetings. You can also give prizes to those who use the program properly during the launch phase. 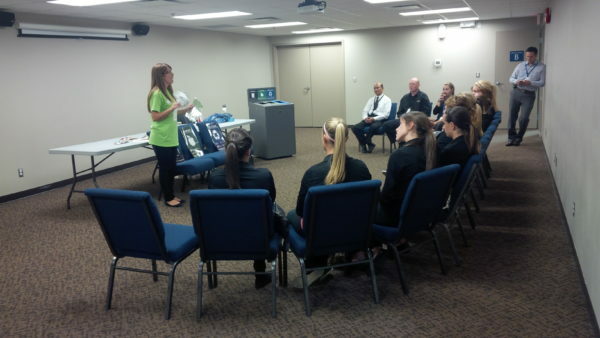 Promoting the program raises awareness and increases participation in the recycling program. *CleanRiver is currently offering the Earth Day Graphics Kit which helps organizations promote and communicate their recycling program. Take your recycling program to the next level today. It’s critical that people know what the goals of the recycling program are and what is required of them to reach those goals. It’s also important to let everyone know where the new recycling bins are situated, and what can be recycled. If people know exactly where the bins are they are more likely to use them. It only takes 2-3 seconds for people to decide where to toss their waste when they approach a recycling bin, so make it easy for them by using clear, easy to understand graphics that help them make the right choice. 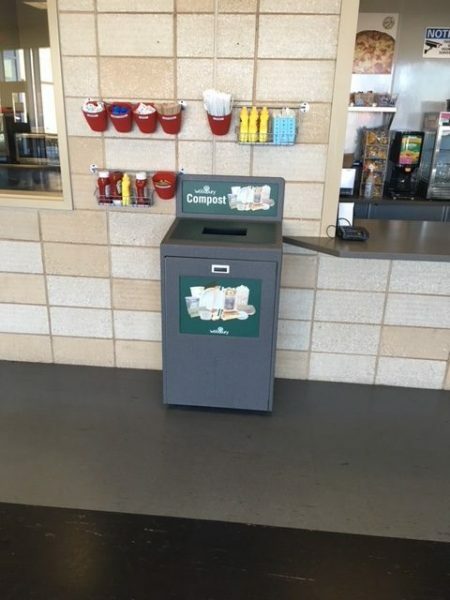 CleanRiver designs custom graphics that feature facility-specific waste. This helps people make the connection between what they’re throwing out and which stream it should be tossed into. It’s a recycling best practice to keep consistent color-coding throughout your facility for each stream. However, you may be surprised to learn that there aren’t any standard colors for recycling streams. If you’re recycling program is lacking consistency, then consider the most popular choices which are often black for waste, blue for recycling, green for compost, and grey for confidential or white paper. 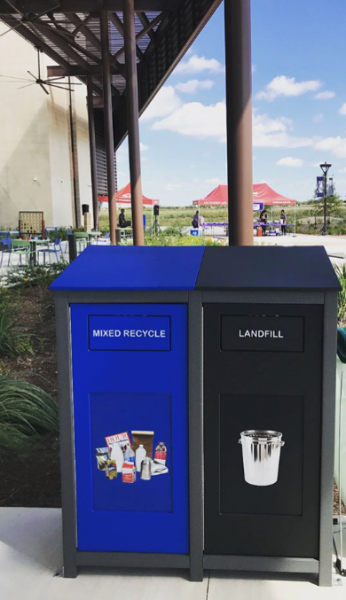 Keep your recycling stream colors, opening shapes, and graphics consistent throughout your facility to avoid confusion and help people do the right thing. 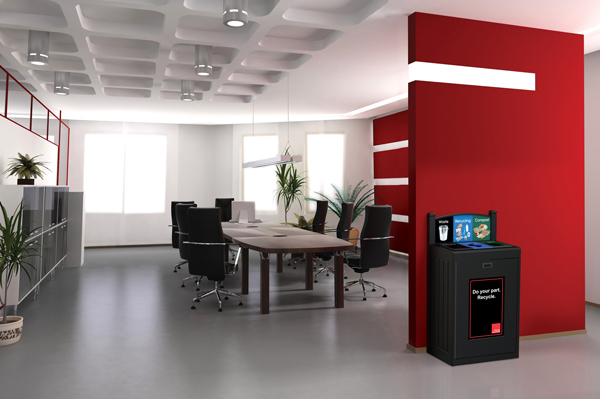 For more tips on getting the right bins for your facility check out: 4 Ways To Customize Your Office Recycling Bins to Fit Your Program. Check out our blogs 4 Tips To Launch A Successful Recycling Program At Your Facility and 4 Reasons Why Your Recycling Program Is Failing for more information on successful facility recycling programs.